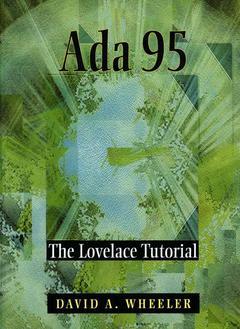 Ada 95 : the lovelace tutorial Wheeler David A.
Auteur : Wheeler David A.
Lovelace provides an introduction to Ada 95, one of the most widely used programming languages in the world. Although the reader is assumed to have a basic understanding of programming, no prior exposure to Ada is assumed and all the basics of the language are covered. The book comprises eighteen chapters each of which is composed of short sections designed to cover a small number of key concept and to provide a test question to check the reader's understanding of the concepts covered. Each chapter then concludes with a small quiz to help ensure that the reader has grasped the principles covered in the chapter. One of Ada 95's new features, its object-oriented facilities, is covered in depth, and all of the essential features of Ada programming are covered thoroughly. In Ada 95 significant enhancements were also added to Ada's ability to interface with other programming languages (such as C, Fortran, and Cobol) and these are covered in one chapter. As a result both students and professional programmers learning Ada for the first time will welcome this new text. Brief Introduction to Ada.- What is Ada?.- Simple Program.- Use Clauses.- Simple Variable, Integers, Parameters and Exceptions.- Questions.- LESSON 2 Basic Ada Structure (Packages).- Program Units.- Declarations and Bodies.- Packages.- Compilation Units.- Review of Basic Ada Structures.- Questions.- LESSON 3 Ada Lexical Elements.- Ada Lexical Elements.- Identifiers.- Numeric Literals.- Character and String Literals.- Questions.- LESSON 4 Procedures and Type Integer.- Type Integer.- Subprogram Declarations and Parameters.- Subprogram Bodies and Local Variables.- Questions.- LESSON 5 Statements (if, loop).- If Statements.- Case Statements.- Simple Loops.- Loop Iteration Schemes.- Questions.- LESSON 6 Basic Types (Float, Boolean, subtypes, record).- Type Float.- Boolean.- Creating Types and Subtypes.- Enumeration.- Arrays.- Records.- Private and Limited Private Types.- Questions.- LESSON 7 Object-Oriented Programming.- Object-Oriented Programming: Overview.- Object-Oriented Programming in Ada: Inheritance.- Dynamic Dispatching (Polymorphism) in Ada.- Encapsulation.- Standard Object-Oriented Format.- Abstract Types and Subprograms.- User-Controlled Initialization, Finalization, and Assignment.- Questions.- LESSON 8 Introduction to String Types.- Type Character and Wide_Character.- Types of Strings.- Basics of Type String.- Passing Strings Between Subprograms.- Unbounded_String Basics.- Unbounded_String Input and Output.- Questions.- LESSON 9 Basic Input and Output.- Simple Text File Input and Output.- Line and File Endings.- Miscellaneous Text_IO Capabilities.- Package Command_Line.- Questions.- LESSON 10 Exceptions.- Exception Basics.- Declaring Exceptions.- Handling Exceptions.- Questions.- LESSON 11 Generics.- Defining Generics.- Generic Formal Parameters.- Example of a Generic Package.- GADTs Versus GADOs.- Questions.- LESSON 12 Access Types.- Declaring Access Types.- Using Access Variables to Create Unbounded Types.- Basic Operations with Access Values.- Using Access Values.- Access Parameters (for Object Orientation).- Unchecked_Deallocation.- Access Variables: Putting It All Together.- Questions.- LESSON 13 Tasks and Protected Types.- Tasking Basics.- Creating and Communicating with Tasks.- Protected Types: Part I.- Protected Types: Part II.- Other Tasking Issues.- Questions.- LESSON 14 Ada-Related Information.- Key Ada-Related Documents.- RM Structure.- On-Line Ada Information Sources.- Questions.- LESSON 15 Ada Program Structure.- Ada Program Structure.- Child Packages.- Questions.- LESSON 16 Interfacing to Other Languages.- General Information on Interfacing to Other Languages.- Interfacing with C.- Ada Bindings.- Java and Ada.- Writing Ada Applets.- A Larger Ada Applet.- Java Interfaces and Aliased Components.- Ada Language Versus Java Language.- Questions.- LESSON 17 Miscellaneous Ada Subjects.- Language-Defined Attributes.- Recursion.- Efficiency.- Safety and Ada.- Software Inspections/Reading Bugs Out.- Other Ada Capabilities.- Questions.- LESSON 18 Sample Ada Program “Small”.- Example Program Small (Introduction).- Small’s Object-Oriented Class Hierarchy.- Any Structures Missing (Locating Operations)?.- Attributes and Operations of Objects.- Parameter Types.- Starting Implementation.- Closing Remarks on Program Small.- Questions.- APPENDIX A Backus-Naur Form (BNF).- APPENDIX B Source Code for the Generic Stack Example.- Package spec Generic_Stack.- Package body Generic_Stack.- Package spec Stack_Int.- Package spec Stack_Stack_Int.- Procedure body Demo_GS.- Procedure body Test_Generic_Stack.- APPENDIX C Program Small.- C.1 Class Diagram.- C.2 Sequence Diagram.- C.3 Collaboration Diagram.- C.4 Source Code for Program Small.- Procedure body Small.- Package spec Creatures.- Package spec Directions.- Package body Directions.- Package spec Items.- Package body Items.- Package spec Monsters.- Package spec Occupants.- Package body Occupants.- Package spec Parser.- Package body Parser.- Package spec Players.- Package spec Rooms.- Package body Rooms.- Package spec Things.- Package body Things 2.- Package spec Ustrings.- Package body Ustrings.- Package spec World.- Package body World.